At the May 7, 2018, University Senate meeting, the Faculty approved three new undergraduate certificate programs. Undergraduate certificate programs offer our students a convenient and flexible way to earn credentials for career advancement. All are cross-disciplinary clusters of courses integrated in a way that identifies a set of skills or knowledge that carry college credit and is applied to a student’s undergraduate degree program. This 12 credit hour Certificate in Food Systems and Hunger Studies provides students with a cross-disciplinary approach to understanding the impact of food systems on food security, hunger, and the overall health and wellness of a community. Through structured experiential learning opportunities, students will apply knowledge of food systems and the environment to develop and implement evidence-based strategies to end hunger in both the United States and globally. The Certificate in Food Systems and Hunger Studies will complement numerous majors and minors offered on campus, but through a multidisciplinary approach and structured experiential learning opportunities tailored towards the interests and professional goals of the student. Students completing the certificate will have the basic knowledge and skills to provide thoughtful and impactful strategies to promote a sustainable food system and fight hunger and related issues. This certificate is designed to provide students with an in‐depth study of Medical Behavioral Science concepts; offer experiential learning activities such as conducting health needs assessments and taking part in supervised shadowing placements; and prepare students for successfully managing the both the intellectual and interpersonal demands of medical training. The program’s course objectives are aligned with the new Behavioral Science section of the Medical College Admissions Test (MCAT) and with Introduction to Clinical Medicine, the University of Kentucky’s mandatory Behavioral Science course for first‐year medical students. Certificate students will receive tailored, supplementary advising about how to use certificate program experiences to enhance their medical school applications from the certificate program director. The Production Engineering Certificate (PEC) encompasses development of students’ experiences and knowledge, and the application of engineering and scientific principles, in automotive manufacturing. It enhances capstone senior design projects, promotes student understanding of key automotive production processes, and involves students in capstone projects that develop knowledge of problems in and potential solutions for automotive production process design. Design projects within the Core Courses are developed through proposals from industry or an engineering organization. The Core Courses also include a Lean Operations Management requirement in which the students will learn and experience the principles within effective and efficient planning and implementation for industrial production. The Elective Courses include three operation-based aspects vitally important in automotive manufacturing, including automotive painting, body welding and automotive powertrain. The PEC certificate will be affiliated with the undergraduate degree programs in the Departments of Chemical & Materials Engineering, Electrical & Computer Engineering, and Mechanical Engineering. Currently enrolled students may declare their intent to complete a certificate program at any time. To do so, they should contact the Student Services or Advising Office where their primary major is housed, but they are not required to see an advisor in their college before adding the certificate. This is the same process a student would follow to add a second program of study to their record. Please encourage students to contact the Certificate Faculty Director as soon as possible to assure their success in the program. During the most recent meeting of the UK Board of Trustees, a new undergraduate degree has been approved. The Bachelor of Arts (BA) degree in United States Culture and Business Practices will be offered within the College of Arts & Sciences, beginning in the Fall 2018 Semester. this program will allow students to complete an interdisciplinary degree that draws together significant training in business with a rich background in the history, politics, arts, and culture of the United States. The proposed coursework will be split between classes in the College of Arts and Sciences Humanities and Social Science departments and classes in the Gatton College of Business and Economics. Through program coursework, students will enhance critical thinking and writing skills; develop communication and other “soft skills;” and hone problem‐solving strategies while integrating key aspects of a business degree, including management, marketing, finance, and economics. This is an innovative and collaborative cross‐disciplinary Program that is not available at UK benchmark institutions, but is rising in popularity across the United States. The degree requires a capstone writing portfolio project and requires 18 credits in the Gatton College along with 24 credits chosen from a range of departments in A&S. Combining business with the liberal arts in this way is similar to what is offered at New York University’s Leonard N. Stern School of Business and at St. Lawrence University’s Business in the Liberal Arts degree. According to the proposal submitted by the two colleges’ faculty leadership to Senate, this new major is an innovative way to approach a growing need in today’s global economy and a more entrepreurial-oriented career trajectory for our students. The major emphasizes the liberal arts skills of inference, communication and research – skills which potential employers seek in new employees. And, it provides students with the more specialized knowledge of business practices. As is stated in the proposal justification to the Senate: “Its objective is to equip students with the knowledge and skills that employers value, that is, to prepare students for immediate job entry while also instilling in them flexible thinking, adaptability, and entrepreneurialism.” This program will be popular for existing students but it could also be attractive for international students seeking an undergraduate degree at UK. The University of Kentucky (UK) Alumni Association, Fayette County Cooperative Extension Services, and UK Human Resources Staff Career Development are pleased to announce the Summer 2018 Central Kentucky Job Club schedule. The purpose of the Job Club is to provide a positive environment for motivated job seekers to meet, connect, share and learn. The free group is open to the public and meets the second and fourth Tuesday of each month, from 9:00–10:15 a.m. at the Fayette County Cooperative Extension office, 1140 Harry Sykes Way (formerly Red Mile Place), Lexington, KY. Business attire is encouraged. Convenient, free parking is available. Even though the 21st century job market is full of new rules and challenges, a high-quality résumé remains an essential marketing and networking tool for job seekers. This session will provide topical information about formatting, content, presentation and general “rules of the road” for developing a résumé that will have impact and advance your career goals. Whether you are just starting out, or well on your way, your professional brand is the key to all new opportunities. LinkedIn is a great professional resource to self-market to employers. Attend and learn 5 LinkedIn steps that will connect you to multiple opportunities in the world of work. Have you ever wondered what goes into the hiring process, or what you can do to make a good impression in a job interview? Frank Patton has extensive professional interviewing experience. He will share strategies to help put your best foot forward in your next interview. This fun and interactive tool is a quick way to identify skills that are central to personal and career satisfaction and success. Use the outcome to recognize transferable skills and to help focus your resume and job search efforts. This session will look at both real and perceived challenges faced by job seekers over 50. Drawing from labor market data, human resources trends, recruiters’ perspectives and the speaker’s professional and personal experiences, participants will identify and discuss their concerns about age as it relates to finding new employment and learn about useful resources to help overcome challenges. This week’s Job Club meeting will feature a panel of local HR professionals and Recruiters. You will learn job search tips and strategies directly from those involved in the recruiting and hiring process. This is an opportunity to get your job search, application, and hiring questions answered, so come prepared with questions for the panel. For more information, call the UK Alumni Association at 859-257-8905, the Fayette Cooperative Extension office at 859-257-5582, or the UK Staff Career Development Office at 859-257-9416. Additional information including testimonials from former Job Club participants can be viewed at: www.ukalumni.net/jobclub. The Kentucky Higher Education Assistance Authority (KHEAA) and the Kentucky Higher Education Student Loan Corporation (KHESLC) have an immediate opening for an Outreach Counselor position in the Central Kentucky region. This position will serve 7 counties in Central Kentucky including: Bourbon, Fayette, Franklin, Harrison, Jessamine, Scott and Woodford Counties. The position represents KHEAA and KHESLC through outreach contacts to increase awareness about financial aid programs, resources, publications and services. The counselor will represent KHEAA and KHESLC at college nights, career fairs, workshops, professional student financial aid meetings and training sessions, providing free information about career choices, postsecondary options and financial aid opportunities to students and families. The counselor will help administer Kentucky College Application Campaign, Close the Deal and College Decision Day in their region and serve as agency liaison with KY College Coaches Program representatives, as applicable. They will promote kheaa.com and KHEAA’s Individual Learning Plan (ILP) and Getting the Facts tools. In addition to explaining how, when and where to apply for student financial aid, the counselor will assist students and families with the financial aid application and admissions processes and promote a variety of agency tools and resources. Candidates must be a graduate of a college or university with a bachelor’s degree and must have three years’ experience in student financial aid, the student loan industry, client relations, marketing, educational administration, public administration, college and career counseling, college admissions or financial administration. Excellent public speaking, diplomacy, interpersonal and time management/scheduling skills are required, along with the ability and willingness to travel frequently. Minimum starting salary is $35,823, plus health insurance, retirement and other benefits. Related prior work experience will be evaluated to determine the final salary amount offered to the successful candidate. For more details, download the .pdf file here. Resumes should be submitted by close of business Friday, June 1, 2018 to hr@kheslc.com. Would your department or program like an easy way to communicate with parents and families of undergraduate students? Consider submitting information to the Parent and Family Association’s Cat Chat email newsletter. Cat Chat is sent 2 – 3 times a month during the school year, typically at the end of the second and fourth weeks of the month, to all our UK Parent and Family Association members (13,000+), and provides campus updates and announcements, important reminders, and opportunities for students and families to be involved on campus. Even if your event or program is only for students, experience has shown that information communicated with families via Cat Chat filters down to students regularly. If you are a faculty or staff member who would like to include information about your event, program, initiative, office, etc. in Cat Chat or on our social media (Facebook, Twitter, Instagram), please complete this online Cat Chat email marketing request form. The Parent and Family Association cannot guarantee that all submitted content will make it into Cat Chat and maintains the right to edit all content. Questions? Contact Nicki Jenkins or Nancy Stephens at parents@lsv.uky.edu, 859-257-2752. Together Lexington, a group of 17 business and community leaders, has been sponsoring a project that will result in a series of downtown Lexington interpretive signs. The signage project offers a new narrative – a way of understanding and representing African-American history in downtown Lexington. The twelve signs, with narrative and images, will be part of a walkable tour of about an hour. More detailed information will be offered via the web on the Together Lexington website: togetherlexington.com. The project grew out of a series of “courageous conversations” last year. Members of the planning committee include local community members and activists, a member of Bluegrass Trust leadership as well as a LFUCG councilmember. University of Kentucky members on the committee were Drs. Terry Birdwhistle, Randolph Hollingsworth and Gerald Smith. Churches – throughout all three eras – starting with Peter “Old Captain” Durrett who moved to Lexington with his wife and began holding services in his cabin at Maxwell Spring in 1790. This became the First African Baptist Church, the first black congregation west of the Allegheny Mountains and the third oldest black congregation in the U.S.
Free Black Entrepreneurs (Frontier/Settlement and pre-Civil War), the South Hill neighborhood included free African-Americans who were successful business people – such as Samuel and Daphney Oldham, Michael and Hannah Clark, Rev. James Turner, Billy and Hannah Tucker, and Rolley Blue. Slavery and Slave Trade in Lexington, focusing on the role Lexington played in the international business of the slave trade and the many jails in the downtown area. Charlotte Dupuy (c.1787—c.1866), wife of Aaron Dupuy who was enslaved on the Henry Clay estate, sued Clay for her freedom. She lost the case, but finally he freed her and her children in the 1840s. Her husband did not gain his freedom until Clay’s death. Alfred Russell (1817-1884), enslaved from birth he and his mother were educated then freed and sent to Liberia in the 1830s to serve as teachers and missionaries. He grew up there to be an important planter, minister and politician. He was elected vice-president of Liberia in 1881 and then served as president from 1883-84. Empowerment through Learning (all three eras), highlighting the fact that many schools were established in Lexington for blacks. After 1865, four free schools were established and by the 1950s high schools were integrated – but many lower schools remained effectively segregated until a 1971 lawsuit forced the city to plan better for full integration of all public schools. Mary Ellen Britton – civil rights pioneer (1855-1925). Born a free person of color, she was an educator, orator and leader of many social reforms, including enfranchisement of women. She went back to school to be trained as a doctor and became the first woman licensed to practice medicine in Lexington. The Jacksons, Community Leaders: Jordan C. Jackson Jr. (1848-1918) and wife E. Belle Mitchell Jackson (1848-1942), focusing on their community activism and business success despite segregation and daily threats of violence. Robert Charles O’Hara Benjamin (1855-1900), a journalist and lawyer who was murdered for his role in championing equality at the voting booth during voter registrations in October 1900. Lunch counter sit-ins (1950s-60s), large marches and peaceful sit-ins in downtown Lexington stores such as S.S. Kresge’s or Woolworth’s led to integration of most lunch counters by August of 1960. Women of the Movement (Voices in the Black Freedom Struggle), focusing on the collaborative work by black clubwomen including CORE President Julia Etta Lewis and NAACP President Louise Grevious. Watch for more information coming as Together Lexington rolls out this exciting initiative. You can tour the downtown with an out-of-town colleague next fall – or include the Lexington African-American Heritage Trail in your syllabus as an extra-credit opportunity for your students to learn more about the town in which they live. The University of Kentucky’s undergraduate certificate programs offer our students a convenient and flexible way to earn credentials for career advancement. All are cross-disciplinary clusters of courses integrated in a way that identifies a set of skills or knowledge that carry college credit and is applied to a student’s undergraduate degree program. See the complete list of all of the University’s undergraduate certificate programs here. Currently enrolled students may declare their intent to complete a certificate program at any time. To do so they should contact the Student Services or Advising Office where their primary major is housed, but they are not required to see an advisor before adding the certificate. This is the same process a student would follow to add a second program of study to their record. Students who have previously earned an undergraduate degree may append a UK undergraduate certificate to that degree once the University of Kentucky has formally accepted that degree (i.e., accepts that student to UK in a post-baccalaureate status). Using the degree audit component of myUK GPS will help determine progress to certificate completion. Faculty directors of the certificate program send notifications of completers (name/UKID) to Sean Cooper (sean.cooper@uky.edu) within a month after the student has earned the bachelors degree. See the more detailed information in this .pdf file. The undergraduate certificate program completion will show up on students’ official college transcripts. However, if students would like a signed paper certificate as well, the college can create one for them. Encourage your academic advising peers across campus and students to use the MyUK GPS for showing students the requirements completed in a Undergraduate Certificate program. If you have any problems, contact your college’s member of the UK Degree Audit team. Eventually, the degree audit component of myUK GPS will serve as the official certification for earning an undergraduate certificate. (See updates about MyUK GPS in a previous Advising Network announcement here: https://www.uky.edu/advisors/node/2253). College advising staff can also help faculty directors with getting reports from HANA Tableau that can aid in getting regular communications out to students who have declared they are pursuing a certificate program. The safety and wellbeing of our campus community is and always will be top priority. This includes younger workers employed during the summer months and throughout the year. As a reminder, University policy permits hiring only persons who are 18 years of age and older in regular full-time staff positions. However there may be times when persons between the ages of 14 and 17 may be hired for temporary jobs. Please read Human Resources Policy and Procedure Number 16.0: Employment of Minors to ensure compliance within your area of responsibility. University policy does not allow anyone under the age of 14 to be hired. Please ensure anyone in your area who might supervise persons ages 14-17 reviews this information. You may also visit the U.S. Department of Labor web site http://www.youthrules.dol.gov/index.htm for federal guidelines related to employment of minors. Compiling a register of all employed minors’ names, ages, and addresses, along with schedules each minor is supposed to work each week. Maintaining a detailed record of actual hours worked by employees each day, including beginning and ending of shift, as well as time taken for meals. This information is captured on timesheets centrally maintained by STEPS. Posting the Kentucky child labor laws (KRS 339.210-339.450) and a list of duties minors are prohibited from performing. Providing these records for inspection at all times by school directors, probation officers and representatives of the Kentucky Labor cabinet (KRS 339.400). Any violation of these guidelines is a serious offense. We appreciate the assistance of hiring departments in ensuring compliance. For minors working in Research Laboratories and Animal Facilities, Environmental Health and Safety has developed policies and procedures to minimize the risk to minors working in these areas. You may review the OHS information here, http://ehs.uky.edu/ohs/minors_0001.php. Questions about the employment of persons ages 14 to 17 should be directed to: Marty Jacks, HR Manager / STEPS Temporary Employment, at (859) 257-9561 or marty.jacks@uky.edu. (FRANKFORT, Ky.) — Kentucky’s colleges and universities are on track to increase the educational attainment of the state’s working-age population from 45 percent of the population with a postsecondary credential to 60 percent by the year 2030. The Council approved an annual progress report that shows undergraduate degrees and credentials at Kentucky’s public and independent colleges and universities totaled 59,009 in 2016-17, an increase of 7.4 percent over the prior year. Combined with graduate degrees, total degree and credential growth climbed 6.6 percent overall. “I have been encouraging our campuses to get ‘better, faster.’ The data we unveiled show that in nearly every metric our campuses are doing exactly that,” said Council President Bob King. “Credit goes to all–from our presidents, provosts, faculty and staff for getting more of our students across the finish line, to our students for achieving their educational goal,” King said. The Council set the attainment goal of 60 percent of Kentucky’s working-age population with a credential or degree by 2030 with the 2016 adoption of the new strategic agenda, “Stronger by Degrees: A Plan to Create a More Educated and Prosperous Kentucky.” The agenda includes a set of key performance metrics with 2020-21 targets for the state and institutions. Moving closer to the national average in educational attainment will make Kentucky more competitive in an economy where the vast majority of newly created jobs since the recession are going to people with a postsecondary credential. Graduation and retention rates continue to improve. Kentucky public institutions remain competitive with SREB states on average net price (out-of-pocket costs). Average net price at Kentucky comprehensive universities has remained essentially unchanged since 2012-13. 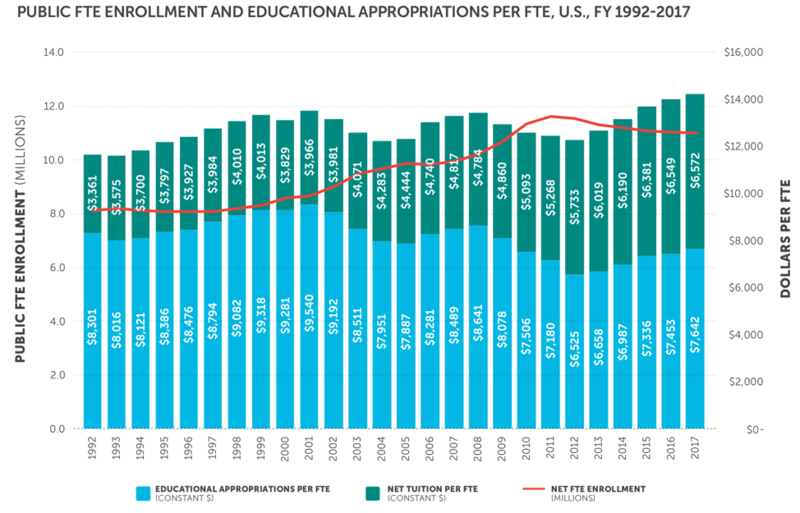 State funding per full-time student fell to $5,848 in 2016-17 and has declined 35 percent since 2007-08, the start of the recession. Currently, about 1.2 million working-age Kentuckians do not have a college degree. Enrolling more of these students will be challenging, as the percentage of adult students without a prior associate degree or higher has fallen from 4 percent in fall 2013 to 3 percent in fall 2016. The progress report offers a detailed look at statewide and institutional performance on these metrics since their adoption. The report includes baseline year data for most of the metrics, and at least two years of trend data. It also includes 2016-17 data for all but a few metrics, which is the most recent year available. Subsets of the progress report include metrics for the new diversity, equity and inclusion policy and the new performance-funding model. An important objective in UK’s Strategic Plan involves outreach and community engagement. The university’s aim is to leverage leading-edge technology, scholarship, and research in innovative ways to advance the public good and to foster the development of citizen-scholars. UK has a long history in this area and our work was recognized in 2015 when we became one of 361 classified Carnegie Foundation for the Advancement of Teaching’s community engagement institutions. One initiative that increased UK’s community outreach and impact was the creation of the Service-Learning and Civic Engagement Center. The positioning of this center within both student and academic affairs (i.e., SAL) reflects the dual nature of the field, and therefore, includes learning that occurs both within the classroom and through activities that take students into the local community. I had the opportunity to tour our new Student Center last week as we prepare for its grand opening. Impressive and amazing are words that don’t quite do justice to the space that will soon be available to our students. A few weeks ago, a plaque containing the poem “Seedtime in the Commonwealth” was installed near the gateway entrance. You can read this poem by Frank X Walker and learn more about the poem’s background in the UKnow article published here. Feel free to send your comments to apsal@uky.edu. View SALutations! Archived Newsletters here.